Some hunters prefer hunting during the night, and there’s nothing more thrilling than having the feel of being the hunter catching its prey on sight. Of course best advised not to watch the Blair Witch Project or they’ll see those stick figures hanging around. So instead of scaring the hunters after mentioning that movie, there are a few night hunting lights on the market that are capable of showing the way to that unsuspecting deer. 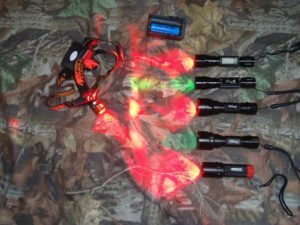 The most common lighting for most hunters is to use red light, since animals have a certain amount of color blindness, thus making night illumination possible. However, it does lack a certain amount of detail since it’s important to know and determine the target is indeed a deer, or some fool wearing a hat with antlers. Red lights are used for hunters who know and live in the terrain so it’s all about lighting towards their targeted buck. The Fenix LOP (1 AAA) is the most commonly used penlight that gives of a significant amount of light without alarming the animal of the hunter’s presence. Mainly just to pinpoint the path and the target, the Fenix is a must have tool, although it does lack a belt clip. Another penlight is the ARC AAA, which is small enough to be held by the mouth. Belt lights are sturdy and give off more lumens for a more detailed search like the Surefire 9P. Although there are powerful ones, a hunter wouldn’t choose one type of belt light that gives off too much focus since it will attract attention. Make sure the area of coverage is dispersed evenly and gives of a good detail to find your path and the buck. The Surefire L-4 Luxeon V is the best example for a belt light with a decent amount of lumens (about 65) that doesn’t compromise the hunter’s position. Though night hunting is more for the professional and hardened hunters, it’s important to know and understand that flooding the forest with light would scare any animal away, especially the whitetail deer. It would be impractical to carry a large amount of gear dedicated for lights alone that you’ll be long tired before the hunt even begins. For night hunting lights, the smaller, with decent amount of lumens, the better it is to carry rather than the pinpoint lights that offer too much brightness. Unless if the hunter has natural night vision, they are better off with at least one penlight.